This gutsy all-female RBTC ensemble will use the phenomenal opportunity of the Open Space Residency at STT to devise a 30 min performance piece to workshop with our audience in December of 2018 titled THE WAYS WE COPE: a workshop. Through movement, poetry, and mixed-media, THE WAYS WE COPE will create an unconventional experience on themes of coping, solitude, and pure resilience. The goal of this workshop and collaboration is to create the bones and beginnings of a full devised production with the intention of submitting it to premiere during Portland’s Fertile Ground Festival in 2020. The group has teamed up with some amazing collaborators on this workshop opportunity, including Cambria Herrera, Trevor Sargent, some friends over at Third Rail, and more! The core of RBTC’s mission is to continually lean into honesty and vulnerability (or as they affectionately call it— to ‘stay soft’) and to encourage a dialogue between artist and audience alike. 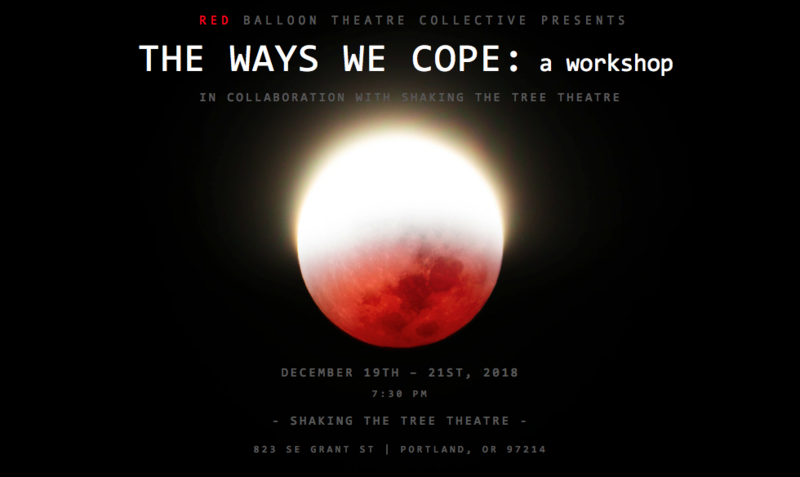 By utilizing resources and maintaining a stasis of empathy, the ensemble is beyond excited to have those who join them in December to be a breathing part of the creation for THE WAYS WE COPE. All shows are FREE! Reservations are highly encouraged.